The gestational diabetes (also known as diabetes type 4) is a diabetes type that appears during a pregnancy instead of a woman with diabetes getting pregnant. This type of diabetes is formed back in most cases but the mother has to live with an increased risk to get a diabetes type 2. Much more fatal is the higher blood glucose level for both mother and baby: Both are at high risks and that means to treat this type of diabetes most restrictively to get the levels down to a normal level of people without diabetes. The higher blood glucose levels are transfused through the ambilical cord to the baby that now starts to produce more insulin and to store the excessive blood glucose as fat. The birth weight of such babys could be ~ 10 pounds above from the average. Of course this could end in further complications i.e. for the accouchement. Another common complication with such circumstances is that the amount of amniotic fluid will increase becuase of the child is urinating more often (the kidney threshold was exceeded). All of this could end in a miscarriage if the mother's blood glucose isn't adjusted properly. 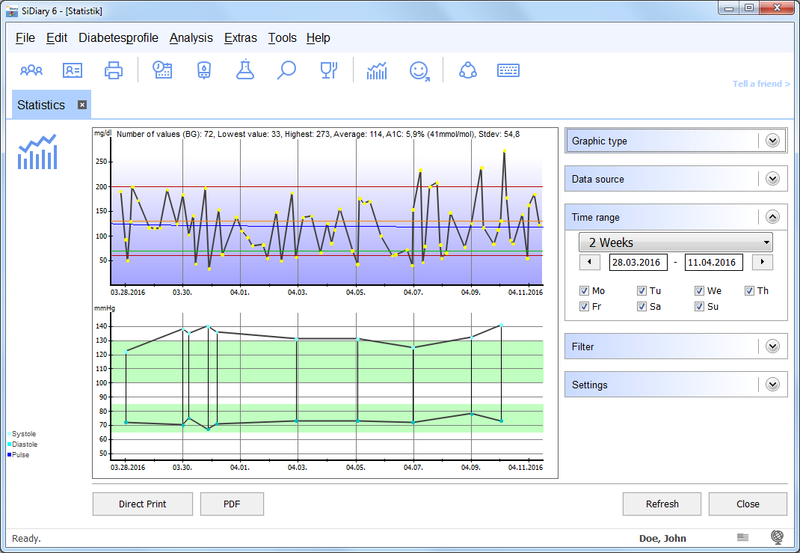 SiDiary can help to to this very accurately when the parameters are not just tracked but also analyzed. Very useful is SiDiary's trend analysis. This will give the patient a great overview about the most important parameters, like the average number of bg level readings per day, the calculated A1c, the standard deviation (which can tell about the ups and downs of the bg level) and finally the post-prandial peaks (which can tell about the adjustment-quality of the mealtime bolus). Of course all of these parameters can be tracked with a paper log book. But then you have to use your pocket calculator to get the statistics out of it and the statistic parameters can reveal major problems within a few seconds!